UNITED NATIONS, January 9 -- As the Yemeni cabinet approved a law that "will also give immunity to officials who worked under Ali Saleh during his 33-year rule," it appears that at least one senior UN system official will benefit: Assistant Secretary General Amat Al Alim Alsoswa, the director for Arab states of the UN Development Program and the "UN's face in the Arab world." 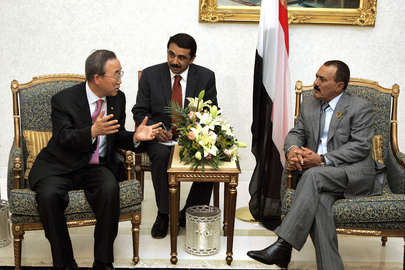 Back in April 2011 Inner City Press asked UNDP, concerning the immunity offered to Saleh in the Gulf Cooperation Council, "whether Ms. Amat Al Alim Alsoswa or any family member... would be covered by the immunity deal negotiated between Saleh and the Gulf Cooperation Council." UNDP replied that "Amat Al Alim Alsoswa assumed her post... after leaving her official functions with the Government of Yemen. Ms. Alsoswa is not part of any political discussion or agreement taking place in or on Yemen." Left unanswered was whether this UN official would be covered by the controversial amnesty deal, which as now reported will "give immunity to officials who worked under Ali Saleh during his 33-year rule" -- as Amat Al Alim Alsoswa did. On November 23, when UN Secretary General Ban Ki-moon after a telephone call with Salah arranged an off-camera encounter with some media in front of the Security Council, Inner City Press was there and asked Ban if he had discussed with Saleh the issue of immunity. No, Ban said, "I have not discussed in detail on that matter." Some wondered: how could Ban not raise the issue? And now a UN system Assistant Secretary General would apparently be covered by the controversial amnesty. Would the UN ask her to remove herself from this impunity? We'll see. As Inner City Press reported on January 6 after getting Palestinian Observer Riyad Mansour to confirm the trip, Ban's planned visit to Lebanon (some now say he's not welcome) includes an UN ESCWA conference there ostensibly on democracy -- at which, Inner City Press has been informed by sources, a Saleh adviser will be speaker. Would former Saleh official Amat Al Alim Alsoswa also be there? Would she speak about the amnesty? Watch this site.